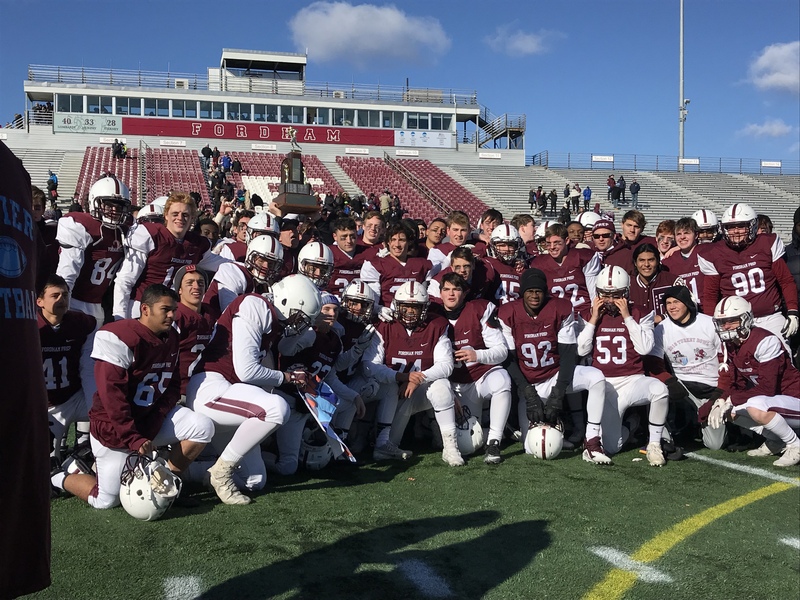 The 96th annual Turkey Bowl took place on Thanksgiving morning on Jack Coffey Field in the Bronx, and the Fordham Prep Rams won their third straight victory 21-13 over Xavier High School. The triumph depended largely on a stalwart defensive effort and a couple of timely scores. Despite the cold weather, the raucous crowd saw the President's Trophy winner Derek Bufano '19 score a pair of touchdowns with Zachary Wallace '20 adding another on a long run. The defense created several turnovers, including one that gave the Prep the ball at their own three-yard line. Additionally, the defense took a goal line stand in the second quarter to keep Xavier off the board and preserve the win. Congratulations to the team on another great season.